If you’re holding out for an LTE version of the new Surface Pro, don’t lose hope just yet. Microsoft has issued a statement correcting its own apparent mistake that spurred reports of a "Spring 2018" release date (so sometime between March and May for our readers in Australia) for the Surface Pro LTE. "Surface Pro with LTE will be available later this year,” a Microsoft spokesperson told Neowin. “We will have more to share regarding specific timing and market availability in the coming months." Again, this statement comes following a report, based on information published on the online Microsoft Store, that the Surface Pro LTE release would not happen until early to mid 2018. Before this mistake was made, it was confirmed that Microsoft would launch the Surface Pro LTE on December 1. This new statement sheds no light on exactly when the new model of the Windows 10 tablet will ship, however. So, we can’t say with confidence any longer that December 1 is the Surface Pro LTE release date but, at the very least, we can rest assured that we’ll see it before the end of the year. Granted, if pushed back any, it can’t go much further back than that – otherwise it’ll miss the heart of the Christmas shopping season. When the Surface Pro LTE does launch, don’t expect it to come in any other variant than the Intel Core i5 edition. This is because of the room needed for the 40-band, Qualcomm Snapdragon X16 modem chip otherwise taken by the fan in the Core i7 models, according to Neowin. At any rate, we’re likely to see Microsoft share “specific timing and market availability” come October 31, which marks the keynote during Microsoft’s Future Decoded conference in London, headed up by none other than Surface lead Panos Panay. We’ll be there to report next week, so keep it locked here for Surface Pro LTE updates. 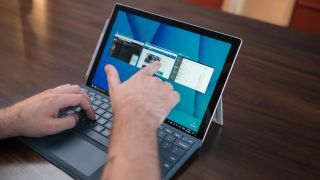 Yes, but will an LTE Surface Pro make our best laptop 2017 list?